These are exciting times in air traffic management (ATM), driven not least by the continuing growth in air traffic, implementation of new technologies and the evolution of various new airspace users. There have been some very significant improvements in ATM performance in recent times yet the challenges keep growing and the pace of change continues to increase. 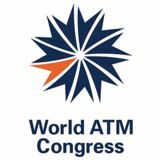 The sense of excitement and anticipation will be prevalent at World ATM Congress 2019 where the entire ATM industry reunites at its annual hub for business, networking and discussions. The scope for the Conference of World ATM Congress 2019 was therefore potentially very wide. However, our consultations on possible themes, topics and speakers revealed a strong desire for the Conference to address the big issues in ATM of capacity, UTM integration and people – so that is what we are delivering, but with some new approaches and new faces. As usual, we are delighted that the Conference will be opened formally by the Minister of Development of Spain, our delightful and welcoming host country. We will then move on to our two keynote speakers to provide us with the ‘Big Picture’ in ATM globally. The session on drones, UTM and the services drone operators require will start with a thoughtpiece on the humanitarian value of drones, followed by a panel on ‘The Voice of UTM’. Four leaders in UTM will provide their unique insights into the present status, their visions for tomorrow and how to get there, and what that all means for ATM. On the second day, the first focus will be on ‘People in ATM’. We are delighted to welcome the inspirational Shaesta Waiz as the opening guest speaker. Shaesta will share experiences of her solo flight around the world but also her mission to inspire the next generation of science, technology, engineering and mathematics (STEM) professionals, especially young women. We then look at two specific people issues in ATM: recruiting and retaining enough women and millennials. Each will be approached differently but with the same objective of how ATM can best diversify through greater use of women and millennials to ensure the resources needed in future. The final session will be a robust debate on the very topical issue of present and future airspace capacity. A strong panel will address what can be done to overcome different capacity constraints in the different regions of the world. We hope that you will find that these very different sessions on subjects reflecting your preferences to be enlightening, topical, interesting and full of relevance and information for you to take away with you. Managing remotely piloted aircraft system (RPAS) programmes that aim to integrate existing and new unmanned aerial solutions into public health government systems to help alleviate some of the most complex challenges in development and humanitarian aid: routine deliveries, medical aid, disease outbreak / epidemics management and natural disaster response. 11.25 – 12.30: Panel: The Voice of UTM The use of drones and unmanned aircraft systems (UAS) is undoubtedly one of the most significant technical, operational and social developments in the world, not just in aviation. There are already numerous projects and initiatives to develop UAS traffic management (UTM) for drones to enable complex operations for large numbers of drones with a high degree of automation in all types of operational environments, including urban areas. Perhaps the most critical success factor will be the ability to allow drones/UAS to operate safely in controlled, integrated airspace along with manned aircraft. That in turn requires a new digital infrastructure and associated concepts of operations and rules that will ensure safe, harmonised and seamless operations for all users of airspace at any level. It is the fastest evolving aspect of airspace — but what are the critical views from those involved in UTM today? This moderated panel will address three key issues: the status of UTM today; the vision for tomorrow and the key challenges to get there; and, from the perspective of UTM, what does all this mean for ATM? Wednesday 13 March 09.15 – 09.45: Special Guest Speaker •	Shaesta Waiz, Founder and President, Dreams Soar, Inc Shaesta Waiz is the founder and President of the non-profit organisation Dreams Soar. Born in an Afghan refugee camp, Shaesta and her family travelled to America in 1987, when she was a young child, to escape the Soviet-Afghan war. Shaesta attended Embry-Riddle Aeronautical University and earned both Bachelor’s and Master’s degrees, the first in her family to do so. She holds a commercial pilot license and is the first certified civilian female pilot from Afghanistan. The mission of Dreams Soar is to inspire the next generation of science, technology, engineering and mathematics (STEM) and aviation professionals, especially young women. Its first initiative was the “Global Flight for STEM”. Shaesta flew around the world alone in a Beechcraft Bonanza A36 aircraft in 2017, becoming the youngest woman (at age 30) to circumnavigate the globe solo in a single-engine aircraft. Her goal was not just to fly around the world to set records or be in the news, but her mission was to educate communities globally about STEM and inspire young girls and boys to be brave and follow their own dreams. Shaesta flew over 24,000 nautical miles on her 145-day journey, visiting 22 countries and personally inspiring over 3,000 children and young adults through 32 outreach events in 14 countries. 09.45 – 10.45: Session Three: Investing in People as Critical Enablers: Diversity and Millennials in ATM Human resources in ATM have never been at such a critical point. As ATM capacity struggles to keep pace with the growth in air traffic, the requirement for skilled and trained people at all levels is selfevident. Yet women represent only a small proportion of the ATM workforce and ATM no longer seems to be so attractive to young people — the ‘millennial’ generation. In time, technological advances, in particular automation and artificial intelligence (AI), will help to close the resource gap but will also change fundamentally the roles of humans in ATM. This session will look at two aspects: how to increase the number and importance of women in ATM; and how to attract and retain the millennial generation. What must be the new USP (unique selling point) of ATM to diversify its human resources to meet the requirements of tomorrow? Part 2: Attracting and Retaining Women and Millennials in ATM Women have made great strides in many professional fields and industries but, as with aviation generally, the number of women in ATM remains low, with an even smaller percentage in leadership roles. More can and should be done to enable the advancement of women into important roles in ATM, not just as a matter of principle, but because it will support the growth and sustainability of the industry. How should we “change attitudes to gain altitude”? The need to attract young people into industry is not unique to ATM or even aviation. A number of initiatives have been launched to encourage STEM professionals, including the ICAO Next Generation of Aviation Professionals (NGAP) initiative. Yet there remains a sense that this is nowhere near enough. Two young professionals in ATM will provide an illuminating insight into why they and their peers chose ATM, what have been their experiences to date and, most importantly, what must change if they are to remain and be followed by others. 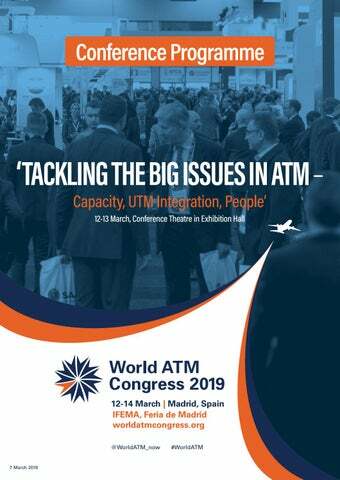 Wednesday 13 March 11.15 – 12.45: Session Four: The Big Crunch — Hard Talk on ATM Capacity Prompt and decisive actions are needed now if ATM and aviation are to fulfil high expectations. Growing ATM capacity at the right pace has always been a challenge given the long-term planning required for ATM infrastructure investments and training of skilled staff in a climate of fluctuating economics, changes in traffic forecasts, and the cost constraints imposed by airlines and regulators. This surfaced dramatically in terms of delays in European ATM in the summer of 2018 with the threat of even worse to come in 2019. But ATM capacity issues are common to all regions and are forecast to become even more challenging as all face significant traffic growth. consistent business plans based on agreed views of likely future developments and requirements, including rolling forecasts of traffic and required capacity? •• How will new technologies and new ATM processes and procedures help to achieve better alignment of capacity and traffic?